Warm Cabbage Pasta Salad, easy summer sides from Thyme for Cooking. The cabbage and onions are softened first, then browned and finished with mustard and vinegar for an easy, healthy pasta salad. Peel and thinly slice onion. Shred cabbage: cut a slice off of the head, lay the slice cut side down, cut into 4ths, then, cutting across, slice very finely: 1/16" - 1/8" (.3cm). Do not use the core of the cabbage - you'll recognize it when you see it. Put onions and cabbage into a nonstick skillet, add stock, cover and bring to a boil. Uncover and cook off stock. Add butter, oil and stir-fry over medium heat until starting to brown. Reduce heat to low and let cook slowly, lightly caramelizing, for another 15 minutes. Just before adding the pasta stir in the mustard and vinegar. 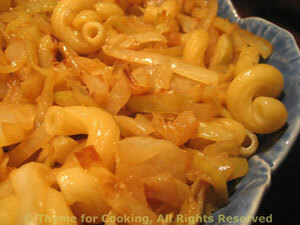 Drain pasta and toss with cabbage and onions.